No Repro Fee..22/10/2012.Mike Aynsley, IBRC CEO, pictured in the The National Museum of Ireland,Collins Barracks. The National Museum of Ireland, in partnership with the Irish Times and the Royal Irish Academy are mounting a public exhibition of 10 objects, chosen by members of the public, which they feel are representative of contemporary Ireland. One of these objects will be chosen as the 100th object and included in a book, A History of Ireland in 100 Objects written by Irish Times journalist Fintan O'Toole and published in spring 2013. 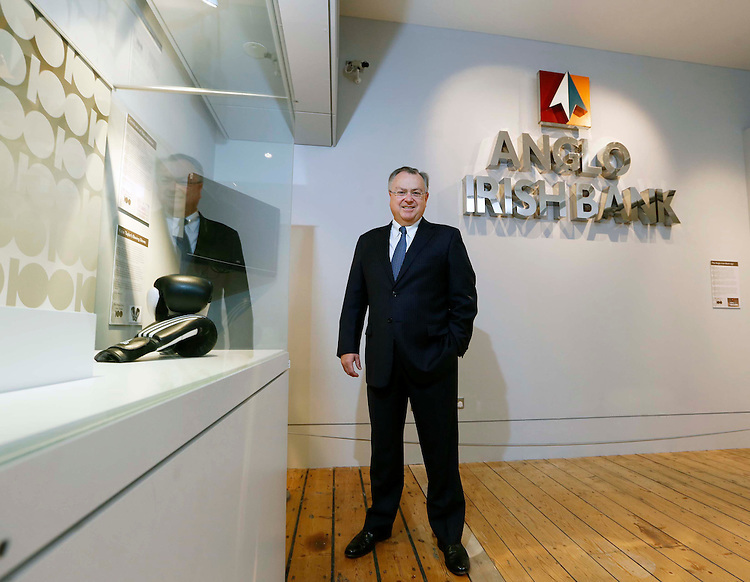 The objects as chosen represent various facets of modern day Ireland and include the Anglo Irish Bank signage. .The exhibition has been profiled in the pages of the Irish Times and opens to the public tomorrow, Tuesday, 23 October and will run until Sunday, 2 December 2012. Members of the public have been encouraged to vote for what they believe should be the 100th object. Pic. Robbie Reynolds/CPR. © Robbie Reynolds Photography |CONTACT |Robbie Reynolds Photography, specialising in Public Relations, Press, Corporate and Commercial photography with over 25 years experience.